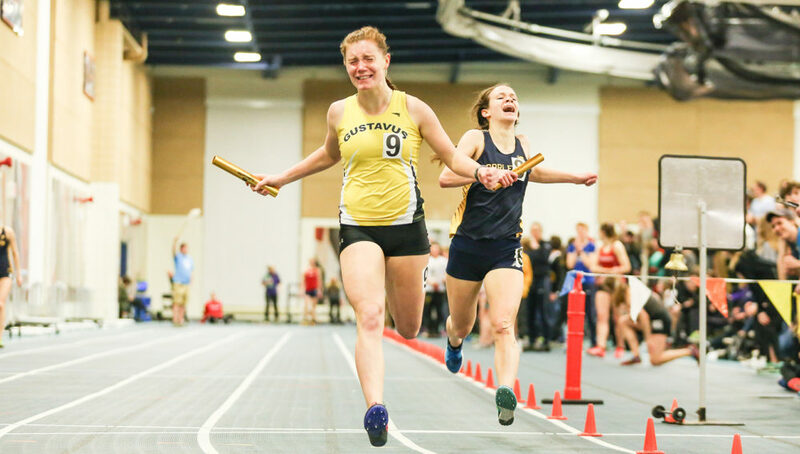 ST. PAUL, Minn. – The Gustavus women’s track & field team scored 49 points to sit in fourth place of 12 teams after day one of the 2018 Minnesota Intercollegiate Athletic Conference Indoor Championships Friday at Macalester College. The distance medley relay squad of Lydia Hayes (Sr., Decorah, Iowa), Megan Hill (So., Denver, Colo.), Abbie Schnabel (Jr., Hamburg, Minn.), and Tierney Winter (So., Waterville, Minn.) led the Gusties during day one, earning 10 points with a first place finish of 12:37.74 – edging Carleton at 12:37.96. Scoring eight points in the high jump was Alex Anderson (So., Sioux Falls, S.D.) with the top individual finish for the Gusties, coming in second place with a leap of 5-4.25. McKayla Stowell (Jr., Le Sueur, Minn.), Olivia Rosenow (Sr., Maple Grove, Minn.), and Katie Keelin (So., Burnsville, Minn.) each posted third place finishes and contributed six team points. Stowell finished the 60-meter dash at 7.80, Rosenow finished the 5,000-meter run at 18:09.81, and Keelin had a weight throw of 46-10. Bailey Van Den Heuvel (Jr., Mondovi, Wis.) finished right behind Keelin at 46-9.50, earning five points. In addition, Schnabel scored points in the 800-meter run with a fourth place finish at 2:17.97, which broke a school record time of 2:18.30 set by Megan Lundgren in 2008. Winter and Sadie Klug (Sr., Waseca, Minn.) finished the mile run at 5:12.15 and 5:14.48, respectively, to score a few points with seventh and eighth place finishes. “We always talk about teams leaving points on the table and us rising to the occasion to get those points and I think our women did a tremendous job of going out there and making sure other teams didn’t get those points,” said Bahr. Gustavus wraps up competition at the Indoor Championships from the Leonard Center tomorrow morning as day two events are scheduled to begin with the triple jump at 10:15 a.m.